Copy tweaks are the easiest of the lot. There’s usually no hassle of running to the designer or the web development team to get things done. You can be on your own and do it all. And when you use A/B testing software that provides a What You See Is What You Get Editor (like Visual Website Optimizer), the job just gets easier. 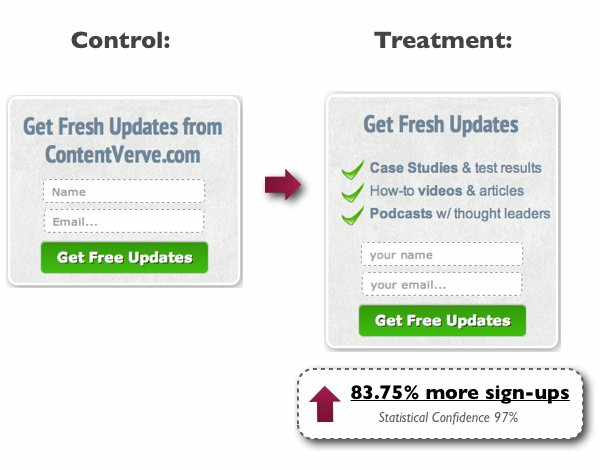 Also, when you need to prove the power of testing to someone, content tweaks are often your best bet. It usually doesn’t take much time to set up these tests. But they can still have significant conversion lifts. Okay, since we all know that headline is probably the most viewed element on the page, it had to be the first one here. Your headline should tell people exactly what they can expect on your website. Follow the No-superlatives Rule – How many of you would fall for a headline that goes along the lines of “I’m the best!”? As in, would you believe a headline that says “We deliver the best pizzas in Canada” or “I’m the #1 photographer in Australia”? Chances are most of you won’t. People say such things all the time. If you are not backing up your claim, they don’t have any reason to believe you. So instead of going for a headline that is plain hype or an exaggerated, unsupported claim, try saying something more believable that your customers care about, in your headline. For example, “We deliver hot pizzas in 30 minutes – or it’s free” by Dominos. It goes without saying that you must have the processes in place before you promise something to your customers. Claiming a 30-minute delivery time on your website and then delivering in one hour will only harm your business and brand. You can check out this post from HubSpot that talks about how data can improve the power of your content. 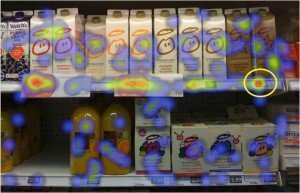 After reading Dan Airley’s book “Predictable Irrationality,” Robert Evans of Think Eye Tracking realized the power of relativity. He believed that when only the promotional items are displayed in a store, the consumers fail to understand the added value of these items in comparison to full price items. 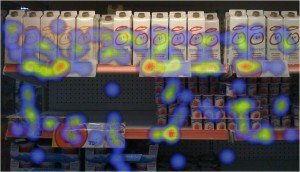 He thereby conducted an eye-tracking study to explore this further and find out if it is actually true. The study tracked customers’ viewing patterns for an on-shelf smoothie product. The image above clearly shows that people are interested in packaging and sale price. 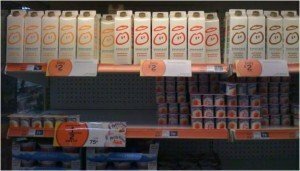 In the second image, you can see some smoothies that were not on offer are placed next to the promotional smoothies that are shown in the previous picture. 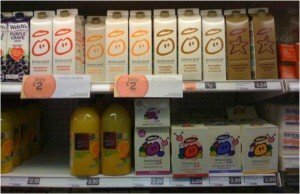 As is evident, people pay a lot more attention to the price of the smoothies that were not on offer, in the second image. This only confirms the argument given by Dan Ariely in his TED talk. He suggested that humans often need contextual cues for evaluating prices. And this basis for comparison makes it easier for them to make decisions. Stevens, who conducted the study, even surveyed their test participants after the experiment. He asked them if they think their purchase was a good value for money. Participants were asked to rate their answers on a scale of 7, with 1 as the best value for money, and 7 as not a very good value for money. How is this useful for you? Next time, instead of providing only the sale price of products on your website, maybe you can test it against the variation where you mention the before-sale price too. It isn’t easy to make people part with their personal information. You have to strike a deal. What’s it that they will get in exchange for that information? And even after you’ve made your offer clear, they can sometimes hesitate in providing that information. On the other hand, when Michael added the word “guarantee” to say “We guarantee 100% privacy. Your information will not be shared,” it increased conversions by 19.47%. Apparently, the negative connotation of the word “spam” and the positivity of the word “guarantee” played its role here. So, if you are thinking of saying something like “We hate spam as much as you do,” maybe you shouldn’t. You can read the complete case study here. Your privacy is important to us. We promise to keep your information safe. Your privacy is our priority. We got you covered. Your information will not be shared. You have our word on that. Of course you have seen those security badges from Verisign, Paypal, McAfee, BBB, and many others. Websites display them to improve their credibility and assure people that their information will be safe. Studies have also shown that adding security badges can improve conversion rates drastically. But the thing is, paying for third-party security can cost you a lot. Because you may think that these security badges will reduce anxiety concerns’ of customers, you may not mind paying for them either. Here it’s important for you to know that there have been instances when adding security seals have reduced conversions too. You wouldn’t want to pay for something that is making you lose business, right? So instead of blindly paying for those third-party security badges, test them. “Okay, still what does this have to do with content tweaks?” Yes, let me get to the point. For those of you for whom these security seals do not work out, or the ones who are just tight on budget and do not want to pay for them, adding assurance text in your checkout process can help. This assurance text can also be particularly useful if your customer base is from older age group. 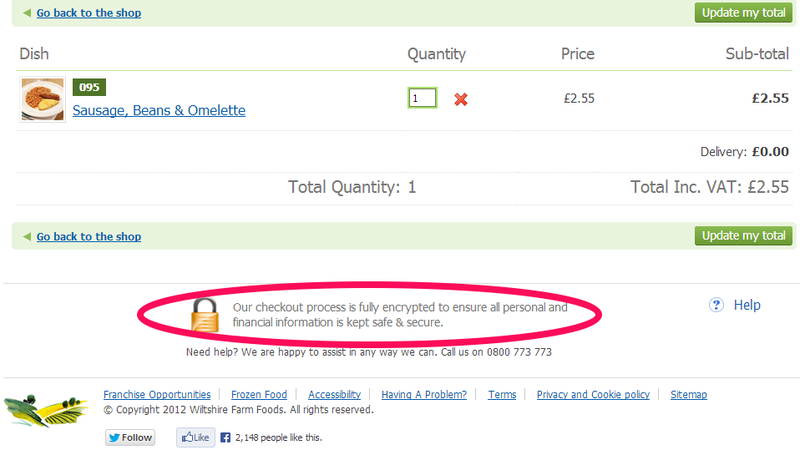 They might not understand what security seals on a website mean. But the assurance text can definitely help to rest their anxiety concerns. Sometimes breaking away from the mundane is all that you need. As long as you keep things simple and to-the-point for your customers, you should be fine. You can test your form copy by changing it from its standard presentation to a narrative one. Yep, you got it right! Like the Mad Libs game we used to play as kids. The form fields can remain the same. A general testimonial, no matter how awesome it may sound, can never convince your prospects enough. Display a testimonial that talks about 1-2 of your features in detail and explain how it contributed to their success. It would be absolutely awesome if you have a testimonial that emphasizes the value of your value proposition or offer (preferably with measurable data). When people know exactly what they will get, it is easier to make them convert. Provide them the necessary details. But don’t overwhelm them. At Visual Website Optimizer, we tried to achieve just this in the recent newsletter that we sent to our customers. 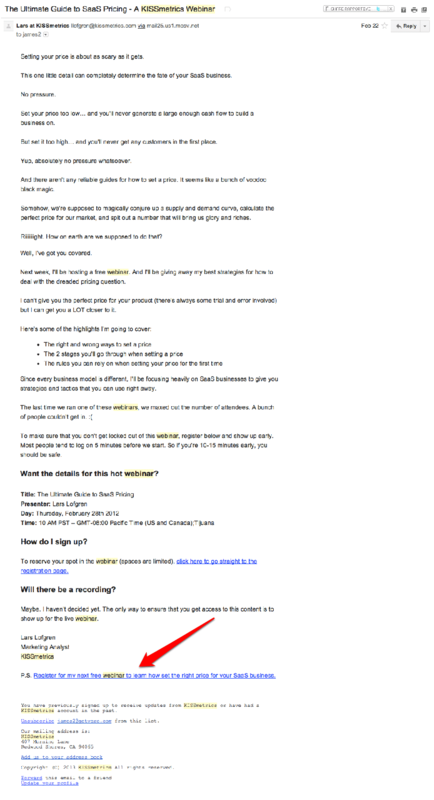 The newsletter was an announcement for our new feature, “IdeaFactory” that we added in our app recently. Instead of telling people plainly about what the feature is about, this time we provided examples of some useful test ideas in the mail. This showed them what they can expect from this new feature if they signup for the app. To be precise, we communicated value before we asked them to signup. Result? Our conversions this time were a lot higher than our average newsletter conversion rate. Your call-to-action text or the text that surrounds it can make a lot of difference to your conversion rate. Add the word “Free” – Test it out and see if it improves your conversions, like it did for our client, Soocial. 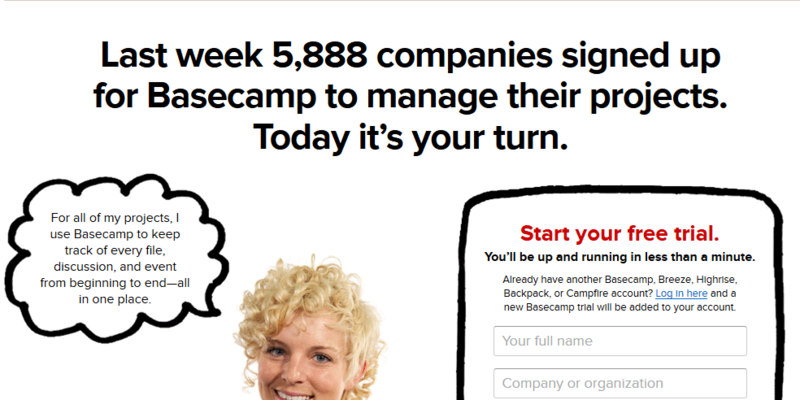 Address anxiety concerns in button text – The button text in the Basecamp image below assures people that it’s a quick signup process and won’t take much of their time. For any of this to work, it’s important to get your basics of readability right. In case, you have never thought about it, I highly recommend that you go through them. They may sound very minor points but there are good chances that you are losing a lot of conversions if you are not following them. And in the end, it all comes down to AB testing. No matter what tweak you want to try, make sure you test it first. @Marko – That’s a nice article for beginners. Thanks for sharing. @Kevin – Of course! Testing is the best way to go. Please keep me posted, if you give it a shot.